A season altering victory or just another high in a roller coaster campaign? 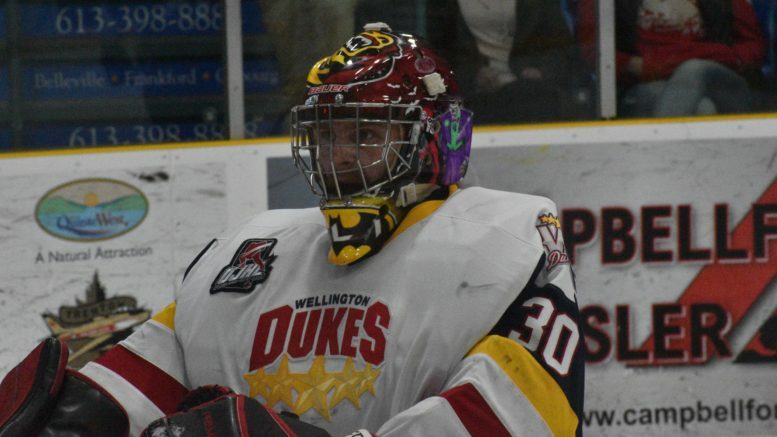 It’s so hard to tell with this team as the Wellington Dukes had their mettle tested on Saturday in Whitby and there were plenty of reasons why the locals might not be able to make it a three game winning streak. A formidable foe in the form of head coach Rob Pearson’s Fury, a team that had only three losses at Iroquois Arena heading into the matinee tilt. And, ah yes, the start time. A 12:30 puck drop on Saturday would hardly be Wellington Dukes head coach John Druce’s preferred start time. But Wellington dug in, played a hard contest and emerged the victor, shading the Fury 3-2. 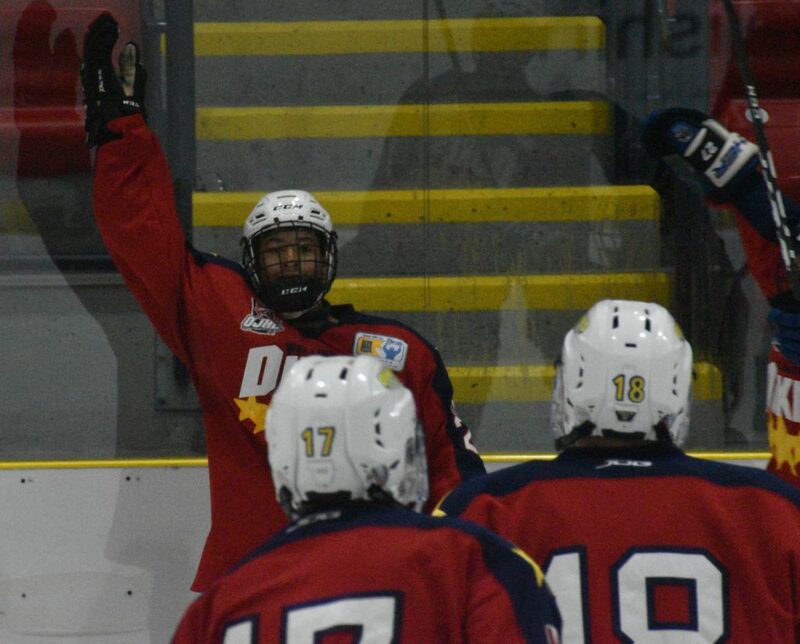 The Dukes (13-11-3) picked up a third straight win on the road against a team above them in the Ontario Junior Hockey League’s East Division. If the club has designs of inserting itself back into contention for the East crown, results like Saturday’s are how the Dukes will accomplish such a feat. “We’ve come out and played hard the last three games. They understand that these division games are very important and there’s a mental focus there to come together and play hard as a group,” Druce said. Wellington got off to a good start as Elijah Gonsalves staked the Dukes to a 1-0 lead inside the first ten minutes but the Fury would get even less than three minutes later as Ian McKinnon beat Olivier Lafreniere at the 10:09 mark to make it 1-1. The Fury, led by bench boss and former NHLer Rob Pearson, took some lumps last season as a relatively young club built around some former minor hockey standouts that the former Maple Leaf coached previously. The move to develop slow and bring in the right mix of veterans appears to have paid off as the Fury are a tough assignment for any opposing OJHL team and among the contenders in the east. Pearson and Druce more than likely lined up against one another in the pros a few times and Druce was highly complimentary to Pearson and his efforts. “Rob’s done a great job developing that team and with that top line of (former Wellington Duke) Greg Smith, Noah Bull and McKinnon, you’ve got to be aware at all times when they are on the ice,” Druce added. It would be Smith coming back to haunt his former squad at 1:33 of the second to give the Fury their first lead of the early afternoon at 2-1. As has been their trademark in the past three games, Wellington responded. Frank Vitucci bagged his third in as many games on a nice unassisted effort within a minute of Smith’s tally to make it a 2-2 score. The game winner would come with under seven minutes left in the frame when Adam Usinger and Ben Addison teamed up to spring Keenan Eddy at 13:22 to make it a 3-2 game. In the third, the Dukes would be outshot 16-4 and a late penalty inside the final minute of play certainly kept things interesting until the final buzzer but Lafreniere was spot in as Whitby hunted for an equalizer. “(LaFreniere) played very well and we were happy to get out goals when we did because Luke Pearson was very good in the Whitby net as well,” Druce added. LaFreniere has received the last three starting assignments and has a 1.97 Goals Against Average in those games. Druce said the Bradford native has put in the effort during practice and side sessions and the results are evident. Wellington will face Lindsay on Friday in their first home action since a 4-1 loss to Burlington back on Nov. 4. Despite holding down the east division basement, the Muskies have given Wellington fits this season, Lindsay holds a 2-1 edge over the Dukes with the locals win coming in a road win in overtime on Oct. 28. In all three games, the Muskies shot out to multi goal leads in the first period and have out scored Wellington 8-0 in opening frames this season. Clearly, Wellington needs to come to the rink ready to play. “I think we’ve had much better starts and if this team have not learned they can’t take anything for granted, we are going to have ourselves some trouble,” Druce said, adding the Lindsay coaching staff led by Dan West deserves a modicum of credit. “They have that team ready to battle hard every single night,” Druce said. Wellington finishes up the weekend on Sunday with an afternoon visit to Markham to play the Royals at 1:30 p.m.